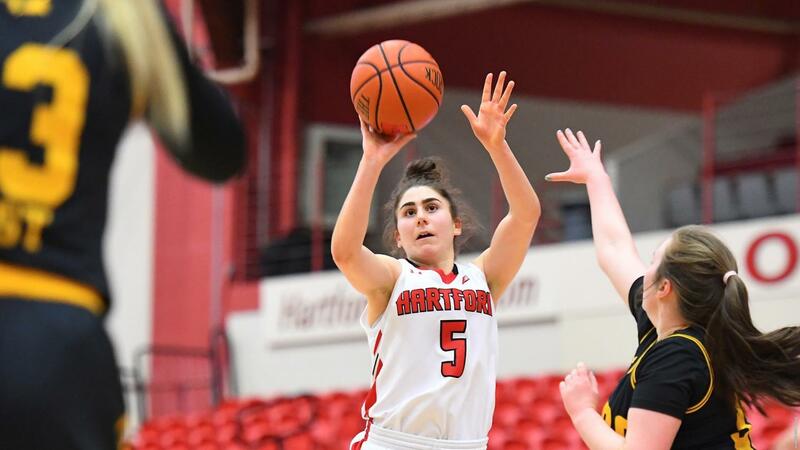 Hartford Women’s Basketball was in top form Wednesday, Feb. 6, as they dismantled the UMBC Retrievers with a score of 92-47 at home. This one was never even close as the Hawks kept their foot on the gas throughout the entirety of the contest. Getting off to a fast start, Hartford opened the game with a 15-3 run in the first four minutes of play. Thanks to a strong shooting percentage of 66.7 percent, and capitalizing on 14 UMBC turnovers, the Hawks finished the first quarter with a staggering 32-10 lead. These trends continued in the second quarter as the Hartford women pushed their lead up to 28 at one point, and coasted into halftime with a comfortable 50-27 lead over the Retrievers. After continuing their dominating performance in the third quarter outscoring UMBC 25-9, the Hawks never let up until the final whistle, securing their victory by a total of 45 points, and along the way, scoring the third most points in school history with 92. The Hawks’ decisive win was thanks in large part to Senior Lindsey Abed’s career night. Shooting 12 for 19 from the field, Abed scored a career high of 36 points in just 29 minutes played. Not only was this a career high for Abed, but her 36 points tied a Hartford Women’s Basketball record, set by Janecka Lopp in 2000. She is now just the eighth woman in program history to score 30 or more points in a single contest. On top of matching the single-game scoring record, Lindsey broke her own school record set last season of eight three-pointers in a single game, with an impressive 10 three-point shots. This precision from behind the three-point line was also good enough to break the America East Conference record of nine threes in a game, a feat previously set by Albany’s Jen Schumacher in 2005. In addition to Abed’s record setting performance, other Hartford women had themselves impressive games as well. Senior Alexia Douglas scored a career high 16 points in the contest, shooting 50 percent from the field. Another impressive statistic for Douglas is thanks to her quick hands, she has now registered three or more steals in the last five game. Two freshmen made their presence felt during the course of the game also. In just her second career start, Freshman Jabria Ingram matched a career high, 11 points, along with four assists and three steals. Freshman Jordan McLemore took advantage of her 13 minutes in the game, dishing out a career high six assists, helping the Hawks reach a season best of 24 assists in the game. Another win for Hartford puts the Women’s team at an overall record of 16-8 with a promising 9-1 record in Conference play. The team will enjoy a well-deserved rest this weekend with no games on the slate until their contest away at Maine Wednesday, Feb. 13. Look forward to that America East showdown, as the second place Hawks, take on the first place Black Bears in a matchup against whom Hartford won earlier this season at home 49-46.